If you don't want to spend upwards of $100 on a costume for the shop, we don't blame you. Halloween doesn't mean throwing every hard-earned penny down the drain. Instead, survey your own makeup stash and you'll surely find everything you need to create a costume in a snap. In this case, you'll need some ocean-toned eye shadows and your fishnets for a mermaid look with a twist. Based off Ryn from Freeform's Siren, this tutorial will have you asking, "Ariel who?" It's equal parts creepy, glam, and cool. Start with your normal foundation routine, apply cool-toned eye shadow on your lid to the brow bone, and then add highlighter to the high points of your face. We recommend using one with a green cast to it, like Wet N Wild Fantasy Makers MegaGlo Highlighter in Moonlit Gleam ($5). Next, it's time to create the fish scales, which you can do one of two ways: Wet N Wild also makes stencils that are easy to apply or you can opt for fishnets. Yes. Fishnets on your head. We don't make the rules here. It looks bizarre, but it works like a charm — trust. Take a densely packed shadow or blending brush and start pushing a gray- or slate-colored pigment into the fishnets. You'll blend shades like blue and green as well so that they fade into each other. Make sure you're picking up a lot of pigment or shadow on the brush and pressing into the skin; fluffy brushes tend to diffuse the product and won't make the scales look as defined. 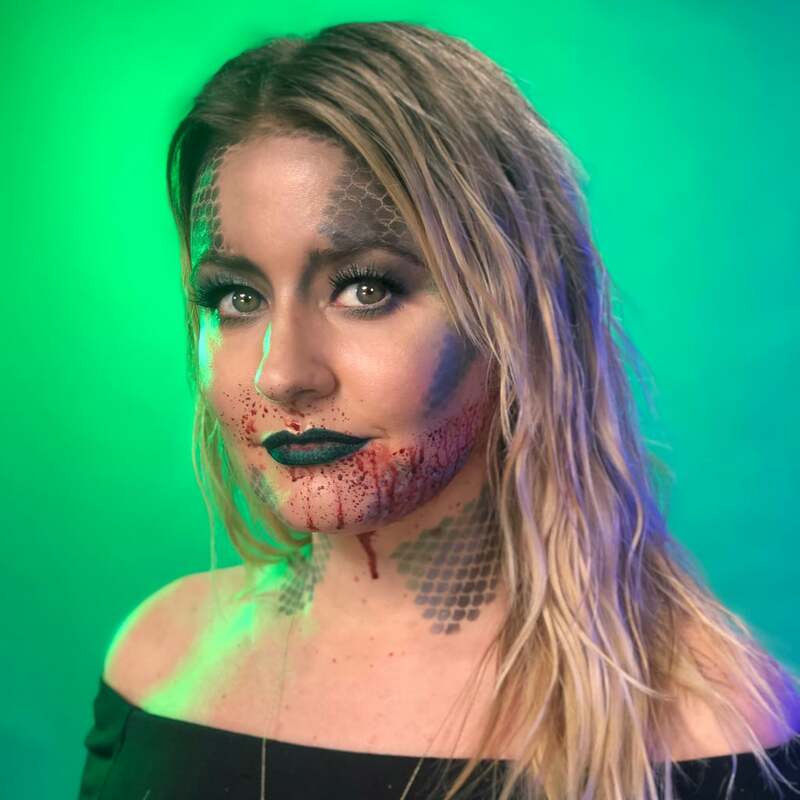 From there, add your favorite sea-inspired lipstick, put on some lashes, and get ready for the final step: fake blood. You'll want to spritz it around your mouth like you've been feeding — that's what makes it creepy. Then you're ready to attack, er, casually sit on a rock and sing about wanting to be where the people are. Yeah, that.